Rivera Recreation Center community meeting hosted by Councilwoman Maria D. Quiñones-Sánchez regarding redesign plans. We believe in contributing to our community in every way possible. When people come together in grassroots organizations, we want to be there to pitch in and to share information about our programs so that everyone knows how to get involved in what we're doing. Our President, Jim Hardy, and other KSC organizers have represented us since 2009 at meetings and events of more than twenty community organizations listed below. Now we need a bigger outreach team to make sure we keep reaching every part of the community consistently so click here to join our Community Outreach Team! Thank you to HACE Team NAS for inviting five of our youth to share their vision for the community! We believe in youth leadership and civic engagement so we support our teens to lead the way in engaging with the community to solve our problems and build on our strengths. Harrowgate Civic Association meeting regarding improvements at Heitzman Recreation Center. 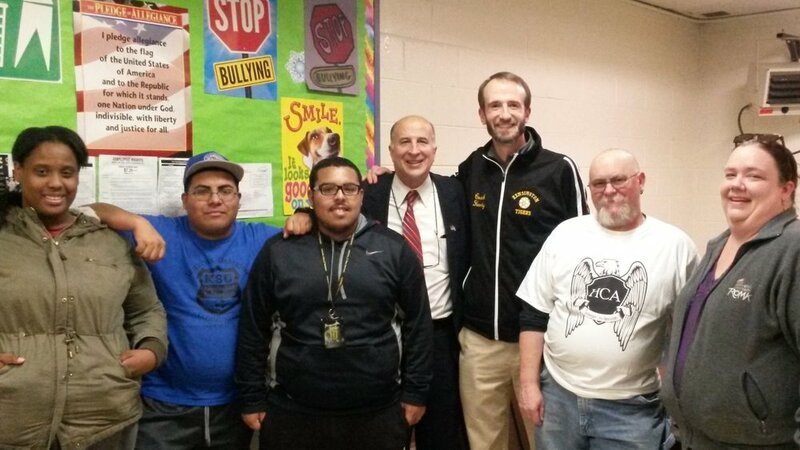 Pictured L to R: KSC coaches Jakeema Burton, Carlos Acosta, and Geoffrey Rojas, Councilman Mark Squilla, KSC President Jim Hardy, and HCA officers Jim Ridgway and Shannon Farrell-Pakstis.